Earlier this week an earthquake devastated Italy, with nearly 300 people being killed. Italy have being mourning those who have lost their lives, with some bodies being kept in coffins in a sports hall in the provincial town of Ascoli Piceno where a funeral was held for 35 victims. 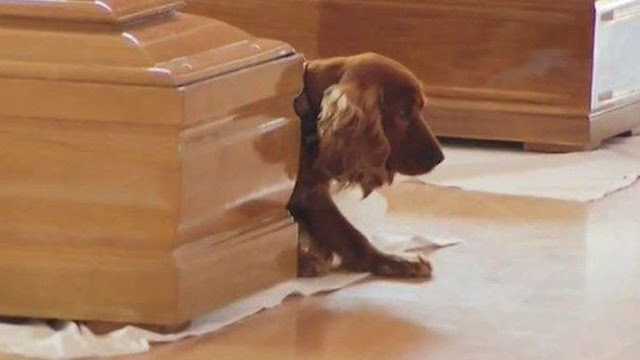 Footage shows the truly emotional scenes of people paying their final respects to loved ones, but the most emotional thing is footage of a dog who won't leave his master's coffin. We already know that dogs are man's best friend, and that their loyalty is unprecedented, but this has got to be the biggest proof of it. The identity of the owner of the cocker spaniel is unknown, but he is thought to be from the village of Accumoli, an area that was highly effected by the earthquake. The loyal companion is seen lying beside the coffin, fixing his gaze directly in front of him, refusing to leave.